Is your kitty a mastermind? Do you sometimes wonder if your pooch is the weakest link? Perhaps your pet is more of a lateral thinker? Now you can test out your pet’s grey cells at home with the zooplus.co.uk range of interactive pet intelligence toys for cats and dogs. The tasks are designed to stimulate your pet both mentally and physically. With most of our toys there is no ‘correct’ way to do things – your pet may find a novel solution to a task, maybe using a paw or his nose, but there is nothing wrong with thinking outside of the box! Does your cat like to bat things with her paws? Then she’ll love swatting the tubes in this game which drop down treats. 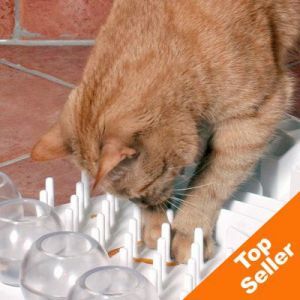 But the fun doesn’t end there, next your kitty must carefully retrieve the treat with her paws from a maze of small pegs. A fantastic way to keep your cat amused and encourage her to exercise as well. This thoughtfully designed fun board offers your cat five unique challenges. Different modules will test out your cat’s skills, encouraging her to retrieve treats, play and exercise her brain and paws. The tasks vary in difficulty so older and less agile cats can still join in the fun. The four boxes in this game are all opened in different ways. Try one at a time first and when your dog gains in confidence you can add in more elements. 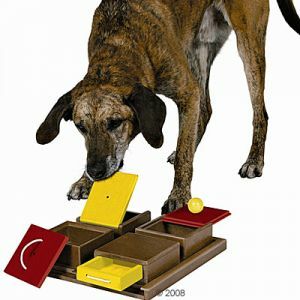 If your dog loves the Poker Box game you could also try the Dog Activity Kicker or even the extra challenging Dog Activity Chess toy. This cleverly designed wooden DogBrick toy has loads of compartments for treats – your dog must carefully consider the best strategy for maneuvering the tabs so he can retrieve them. Try leaving one or two compartments empty to keep him guessing! Remember intelligence toys are designed to be a fun activity for pet and owner so always supervise your pet when they are playing with them. Visit zooplus.co.uk to view our full range of interactive pet intelligence toys.